U.S. District Judge Sean Cox said Schmidt (pictured) was "a significant player" in VW's actions, which undermined the trust between buyer and seller in the U.S. economy. DETROIT -- Oliver Schmidt, the former high-ranking executive who spearheaded Volkswagen's multiyear efforts keep its conspiracy to cheat on diesel emissions a secret from U.S. regulators and failed to cooperate with investigators, received the maximum sentence possible Wednesday from a federal judge in Detroit. Schmidt, 48, was sentenced to seven years in prison and a $400,000 fine on Wednesday by U.S. District Judge Sean Cox. In August, he pleaded guilty to two felony charges of conspiracy to defraud the United States and violating the Clean Air Act. A third charge of aiding and abetting wire fraud was rolled into the conspiracy charge in a plea agreement. Cox agreed to allow Schmidt to continue to serve his sentence at the federal penitentiary in Milan, Michigan, where he has been behind bars since March. As part of the sentence, Schmidt will get credit for the nearly 11 months that he has so far been incarcerated. Schmidt, the former general manager of Volkswagen's U.S. Environment and Engineering Office in suburban Detroit, has been in custody since his arrest in January while attempting to return to Germany from a family vacation in Florida. His efforts to secure release on bail prior to his plea were rebuffed by Cox, who called him a "flight risk," a decision that was later upheld on appeal. Schmidt is one of eight current or former Volkswagen engineers or executives charged in Volkswagen's global conspiracy to cheat on diesel emissions. However, only one other Volkswagen employee, engineer James Liang, has thus far faced justice. Liang, who, unlike Schmidt, cooperated early on with investigators, was sentenced by Cox in late August to 40 months in prison -- longer than was sought by prosecutors -- in part, Cox said, because he was aware that he had to sentence Schmidt this month. Wednesday, Cox said Schmidt was a central figure to the conspiracy. "In my opinion ... you are a key conspirator responsible for the cover-up in the United States of this massive fraud perpetrated on the people of the United States," the judge said. "I'm sure, based on common sense, that you viewed this cover-up as your opportunity to shine. That your goal was to impress senior management to fix this problem. .. to make yourself look better, to increase your opportunities to climb the corporate ladder at VW." Cox said Schmidt was "a significant player" in VW's actions, which undermined the trust between buyer and seller in the U.S. economy. "You knowingly misled and lied to government officials. You actively participated in the destruction of evidence. You saw this massive cover-up as an opportunity ... to advance your career at VW. This conspiracy, which you were a key part of, in particular the cover-up, is a very troubling crime against our economic system. It attacks and destroys the very foundation of our economic system, the trust by the buyer of our economic system," Cox said. Before his sentence, a nervous, tearful Schmidt choked up several times while reading a letter to the court accepting responsibility for his actions. He thanked his family and friends for supporting him, and said he has not been able to sleep at all while awaiting his sentencing. He also admitted that he had tried to use his personal relationships in the U.S. to keep regulators in the dark. "For the disruption of my life, I only have to blame myself," Schmidt said. "I justified my decisions by telling myself that I was obliged to speak for my superiors. The man that stands before you today no longer believes that." Schmidt admitted that his remorse was of little use now: "I'm deeply sorry for the wrongs I've committed, and I'm as ready as I'll ever be to accept my punishment now." In a letter to Cox last week, Schmidt said he first learned about the company's emissions-testing evasion scheme in summer 2015. Schmidt said he was given "a script, or talking points" approved by VW management and "high-ranking lawyers" to follow when he met with California environmental official Alberto Ayala on Aug. 5, 2015, Bloomberg reported. "Regrettably, I agreed to follow it," Schmidt wrote. "In hindsight, I should have never agreed to meet with Dr. Ayala on that day. Or, better yet, I should have gone to that meeting, ignored the instructions given to me" and admitted "there was a defeat device in VW diesel engine vehicles and that VW had been cheating for almost a decade." But Schmidt's own emails -- recovered prior to his surprise arrest in January -- point to his sounding alarm bells within the company up to a year earlier. In April 2014, Schmidt was notified that independent testing at West Virginia University had discovered that VW diesel vehicle emissions vastly exceeded federal standards. Investigators say he sounded the alarm bells within the automaker the same day, writing to a colleague: "It should first be decided whether we are honest. If we are not honest, everything stays as it is." More than six weeks later in 2014, Schmidt took his growing problem up the company ladder, writing an email to the head of Volkswagen of America noting the economic risks to the company, and the possibility of an indictment. In a pre-sentence filing, Schmidt had sought a sentence of 40 months of supervised release and a $100,000 fine. Before the sentencing, Schmidt's attorney, David DuMouchel, argued that his client's sentence should be less than that of Liang, saying that Liang had been involved in the conspiracy from the beginning in 2006 and through the whole conspiracy, while Schmidt was only involved for two months "at the very end." DuMouchel argued that his client was following orders from Volkswagen to continue to conceal the presence of "defeat device" software from regulators, but said his client admits he did wrong. "Mr. Schmidt was asked, at the very end, to conceal from regulators the existence of the defeat device. And he did it," DuMouchel said, adding that his client now wishes that he had not lied to California regulators in August 2015, which he implied was Schmidt's worst day. "I wouldn't want anybody to judge me on my worst day." But prosecutor Ben Singer argued that Schmidt was key to keeping the conspiracy under wraps, that he deleted evidence, and that he had directly briefed VW CEO Martin Winterkorn in July 2015 about the cover-up and was ordered to lie to keep the defeat device secret, and carried out that order. "He was in the room, and every time he was in the room, he chose to lie. And that's how this crime happened," Singer said. Volkswagen earlier this year pleaded guilty before Cox to a felony for its diesel emissions scandal, which has now cost the automaker as much as $30 billion. Volkswagen has attempted to put its diesel scandal behind it as much as possible. It has largely abandoned its diesel strategy globally in favor of electric vehicles, and has says it continues to cooperate with U.S. investigators to seek those responsible for the decisions to cheat on diesel emissions. Asked to comment on Schmidt's sentencing, a Volkswagen spokeswoman emailed the following statement: "Volkswagen continues to cooperate with investigations by the Department of Justice into the conduct of individuals. It would not be appropriate to comment on any individual cases." 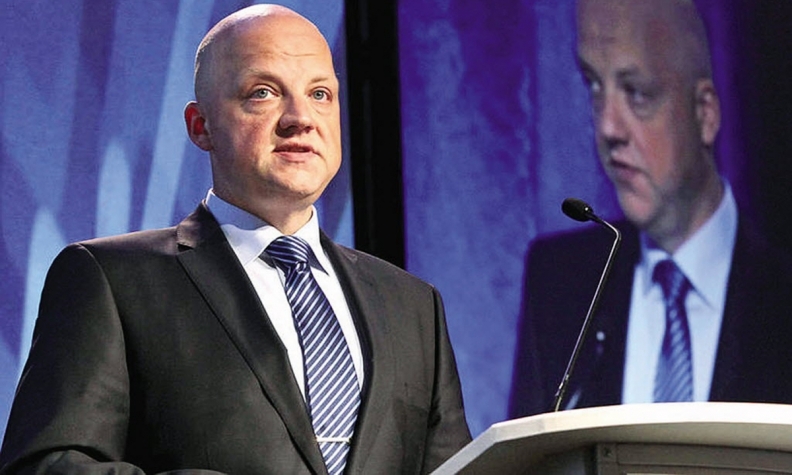 However, in August, global Volkswagen brand head Herbert Diess told Automotive News that the diesel scandal is now part of the brand's checkered history. "It was a very big scandal," Diess said. "It's something we have to live with."